This is Peki's full fledged lecture video on manipulation with balls. It was originally released in German in 1994, but Peki has dubbed it himself in English. If you want to learn how to manipulate balls this is the video to learn it from. Jeff McBride has very good lecture videos on the market, but keep in mind that Jeff McBride started with stage manipulation seeing Peki perform. I have had other billiard balls videos before. 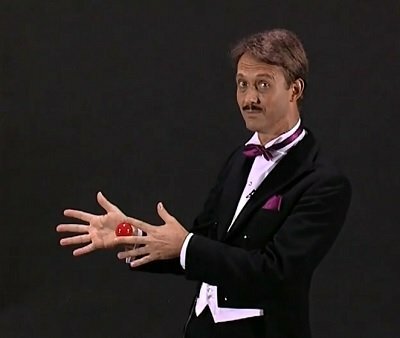 And the Peki video gives his prospective and techniques, on handling the balls. The video is very good, in my opinion. Also, I believe that some of the information is hard to find, anywhere else. It's definitely a great start, in learning billiard ball manipulation. I highly recommend this video.